저널명Biochem Biophys Res Commun. 2017 Aug 26;490(3):991-996. Outer membrane vesicles (OMVs) derived from bacteria are promising candidates for subunit vaccines. Stresses that modulate the composition of outer membrane proteins (OMPs) are important for OMV synthesis. Small RNAs (sRNAs) expressed in response to stress regulate OMPs, although the mechanism underlying sRNA-mediated OMV biogenesis and its utility for developing vaccine platforms remains to be elucidated. Here, we characterized the role of a sRNA, MicA, which regulates OmpA, a major OMP involved in both production of OMVs and reactive immunity against Salmonella challenge. A Salmonella strain overexpressing MicA generated more OMVs than a control strain. 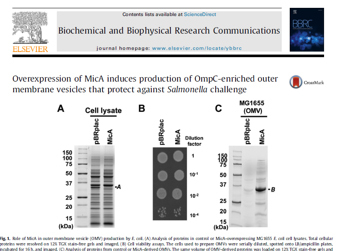 In addition, OmpC was the major component of MicA-derived OMV proteins. MicA-derived OMVs induced Th1- and Th17-type immune responses in vitro and reduced Salmonella-mediated lethality in a mouse model. Thus, OmpA-regulatory sRNA-derived OMVs may facilitate production of Salmonella-protective vaccines. 이전글Polycomb group protein-mediated histone modifications during cell differentiation.